I wrote this review while participating in a blog tour for Mom Central Consulting on behalf of the Grain Foods Foundation. I received a promotional item to thank me for taking the time to participate. 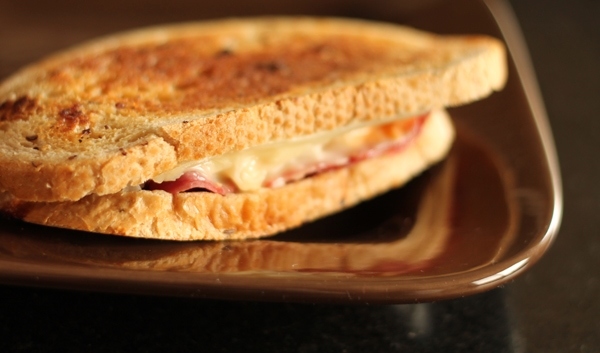 Did you know that this year marks the 250th year of the sandwich? 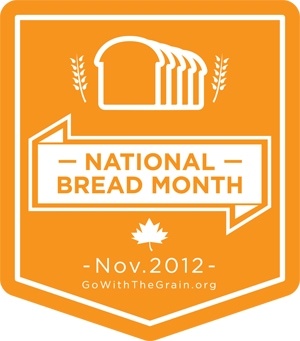 November is National Bread Month and we are celebrating by talking all about Sandwiches! Sandwiches are a staple in our household because they are one of the easiest meals to make and can still be healthy! I like a nice whole-grain wheat bread on my sandwiches, whereas my husband prefers a honey wheat or white. My husband works outdoors often doing physical labor, so it is important to him to have a meal that will give him some energy from the fiber and complex carbohydrates to finish out his day. He packs a lot of sandwiches to take with him so that he doesn’t have to run out and purchase fast food while he is out working. For National Bread Month, I have decided to pay tribute by making my personal favorite: The Reuben Sandwich. Using an electric skillet, turn it on and set it to a temperature that you would use to toast bread. We set ours at 350 degrees Fahrenheit to begin with and adjust as needed during the cooking process. Butter one side of the rye bread and place buttered side down onto the skillet. Add Corned Beef Slices, Sauerkraut, Thousand Island Dressing, and Swiss Cheese. Butter another slice of rye bread on one side and place on the sandwich with the buttered side up. This way, when you flip the sandwich, you can toast both sides and make sure the sandwich is heated completely through. Continue to flip sandwich until both of the outside slices of the bread are well toasted. 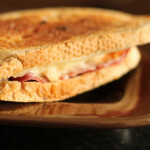 For more great sandwich recipes, please visit the Grain Foods Foundation. Celebrity Chef Bryan Voltaggio has prepared some amazing recipes that are a great way to get more creative with your sandwiches.